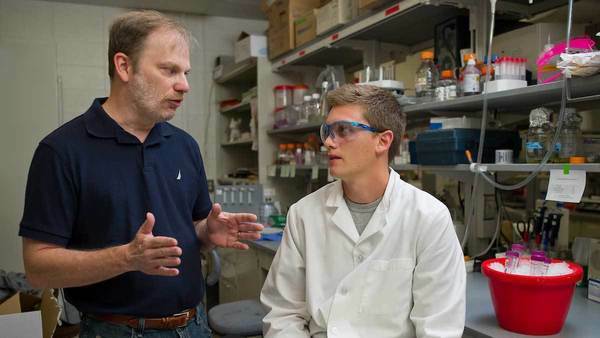 In a new study published in the Journal of Experimental Medicine, scientists at the University of Notre Dame have discovered that the pathogen Mycobacterium tuberculosis (MTB) releases RNA into infected cells. This RNA stimulates the production of a compound known as interferon beta that appears to support the growth of the pathogen. As part of the study the researchers found that mice lacking a key protein required for responding to foreign RNA and therefore required for interferon beta production were better able to control the MTB infection. The discovery was a surprise to the researchers, as interferon beta is essential to controlling several viral infections. MTB infections cause a battle between the immune response and the ability of the bacteria to circumvent that response — who wins the battle determines the body’s ability to control the infection. Schorey and Yong Cheng, a research assistant professor at Notre Dame, set out to determine how mycobacteria RNA could be affecting the host response. What they found was that by releasing RNA, the bacteria set off a chain reaction inside the macrophage, a cell type of the immune system — resulting in a mechanism that benefits the survival of MTB through the production of interferon beta. While researchers have long known that bacteria produce proteins and other compounds to modulate an immune response, such a role for mycobacterial nucleic acids has only recently been defined. In viral infections, as opposed to bacterial infections, the virus releases its nucleic acids as it needs the machinery of the host cell to help make viral proteins and replicate its genome. In contrast, bacteria already have the machinery for these processes in place, suggesting the release of RNA into the host cell is intentional. The authors found that the MTB use its secretion system known as SecA2 to mediate RNA release from the mycobacteria. MTB is the No. 1 cause of death by an infectious organism, and kills up to 1.8 million people each year. The World Health Organization estimates 200,000 of those deaths are children. Health officials lack an effective vaccine against pulmonary tuberculosis, and antibiotics used to treat the disease must be taken for six to nine months — a daunting regimen that challenges patient compliance. The disease is prevalent in parts of the world where health care systems lack infrastructure and funding. Despite those challenges, Schorey, an affiliated faculty member at Notre Dame’s Eck Institute for Global Health, said the study’s results show potential for the development of immunotherapies to selectively stimulate protective immune responses as a treatment option for MTB and other bacterial infectious diseases. The study was funded by the National Institute of Allergy and Infectious Diseases. Originally published by Jessica Sieff at news.nd.edu on December 05, 2018.